Latest Updates on Budget 2019: Standard tax deduction for salaried persons raised from Rs. 40,000 to Rs. 50,000. Read here the key highlights of Interim Budget 2019. The Finance Minister Jaitley introduced Standard Deduction in Budget 2018, giving the salaried class something to rejoice about. The ’Standard Deduction’ of Rs 40,000 replaced the transport allowance Rs. 19200 and medical reimbursement of Rs. 15,000 per annum. Interestingly, the provision of Standard Deduction was earlier available but was abolished in the Finance Act 2005. They are usually deducted from the gross salary and claimed as an exemption. The government has proposed requisite amendments to Section 17(2)(viii) of the Income-tax Act, 1961. 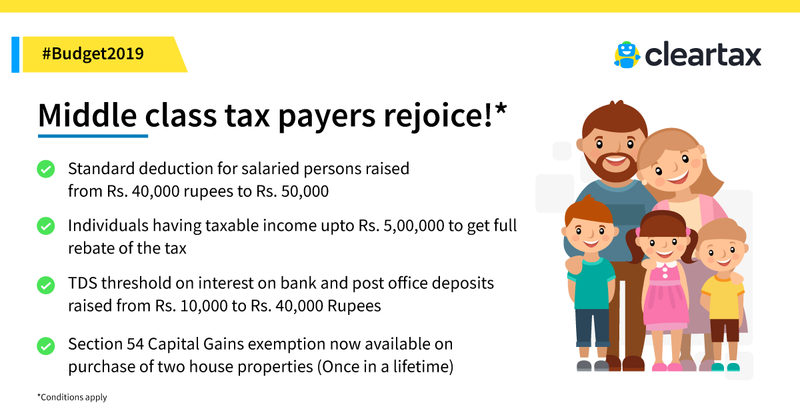 As a result, the effective additional benefit on account of the standard deduction would be an additional income exemption of Rs 5,800. From the above, it is evident that the taxable salary has come down on account of the standard deduction. In a recent clarification issued by the income tax department, if a taxpayer has received a pension from the former employer, it is taxable under the head ‘Salaries’. Therefore, the taxpayer shall be entitled to claim a standard deduction of Rs. 40,000* or the amount of pension, whichever is less. * Increased to Rs 50,000 for FY 2019-2020(AY 2020-21) through the Interim Budget 2019. All said and done, though the impact of this amendment for the salaried may appear to be minimal, employers, with this move, would stand to gain in terms of being spared of a whole lot of administrative efforts in processing medical bills of its employees. Perhaps, that was the intention of the legislature.